Trees for Missoula is a non-profit advocacy group committed to the belief that trees individually and the urban forest as a whole are a critical element of a livable urban environment. ● We educate Missoulians of all ages about the value and benefits of our urban trees public and private — and the roles we all play in keeping those trees healthy. ● We promote the proper planting and care of trees. Trees for Missoula’s mission is to promote a healthier and sustainable urban forest through community planning, planting, stewardship, education and advocacy. 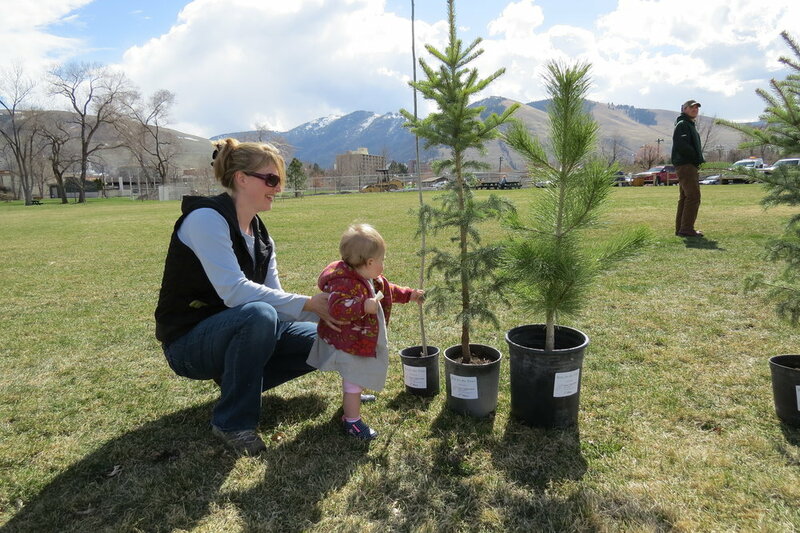 Trees for Missoula strives to increase public awareness regarding the importance of trees in the urban environment. Trees for Missoula is committed to increasing resources for tree planting and maintenance in Missoula. In all of its programs, TFM seeks to improve our City’s environment, build community and connect Missoulians with the natural world and each other. Trees for Missoula is one of many programs and projects for which Friends of Missoula Parks (FMP) provides fiscal sponsorship. Through this partnership, Trees for Missoula has been able to apply for grants and receive tax-deductible donations. Friends of Missoula Parks, Inc. was formed in 2002 by Missoula residents to provide a non-governmental entity to contribute to Missoula’s park and recreation amenities. FMP is a 501(c)(3) non-profit corporation that can accept tax-deductible donations. As a non-profit corporation, Friends of Missoula Parks is also eligible to apply for foundation grants. Friends of Missoula Parks also serves as a fiscal sponsorship organization for groups wishing to gain non-profit benefits that do not have their own non-profit organization. These fiscal sponsorship agreements allow groups to provide tax benefits to their donors. Karen Sippy is a founding member and executive director of Trees for Missoula (TFM). Karen arrived in Missoula in 2003, immediately falling in love with the city and its trees. Growing up in the Midwest, Karen could often be found high up in her favorite place, the catalpa tree in the front yard of her childhood home. She was born a tree hugger, so after working as a middle school teacher, public speaker and sales manager, it was time to retire to a life of giving back to her community and to the trees. Since 2011, she has worked closely with Missoula’s Urban Forestry Division, in an effort to identify how the community and TFM volunteers could best promote a healthy urban forest. She served on the committee that wrote the 2015 Missoula Urban Forest Master Management Plan, and looks forward to continuing her work supporting Missoula’s urban forest. Karen is also a founding board member and treasurer for Grant Creek Trails Association, a board member for Friends of Missoula Parks and a member of the Conservation Lands Advisory Committee. June 2011 - Recognizing the need for an urban forest friends group, Friends of Missoula Parks put out a call. A diverse group including tree-loving private citizens along with UM, GIS, USFS and DNRC experts gathered to find out what help is needed and founded Trees for Missoula. April 2012 – Trees for Missoula becomes the major sponsor for Run for the Trees with volunteers handing out seedlings to run participants. Summer 2012 – Irrigation bags are used for the first time on Missoula’s newly planted trees, and Trees for Missoula volunteers distribute information to residents about them. January 2014 - Representatives from the City of Missoula Urban Forestry staff, Trees for Missoula, USFS, DNRC and Friends of Missoula Parks meet bi-weekly to create the first Urban Forest Master Management Plan, which serves as a guide for community and volunteer engagement. April 2015 – City of Missoula Urban Forest Master Management Plan is approved by city council. October 2015 – The first Volunteers in Pruning (VIPs) class is trained. April 2016 – Trees for Missoula and City of Missoula Urban Forestry partner to build a bare-root gravel bed at the Missoula Wastewater Treatment Facility. September/October 2016 – Trees for Missoula volunteers plant the first gravel bed bare-root trees in city boulevards and parks. October 2016 – Trees for Missoula along with Missoula Art Museum and City of Missoula Urban Forestry receive a DNRC grant for Montana’s first suspended pavement system at the Missoula Art Park. December 2017 – Trees for Missoula receives a DNRC Program Development Grant for a shade shelter project. Make your tax-deductible donation to Trees for Missoula here.